These eight life-sized tromp l’oeil cow skulls float away from the gallery wall, furthering the illusion that they are three-dimensional. 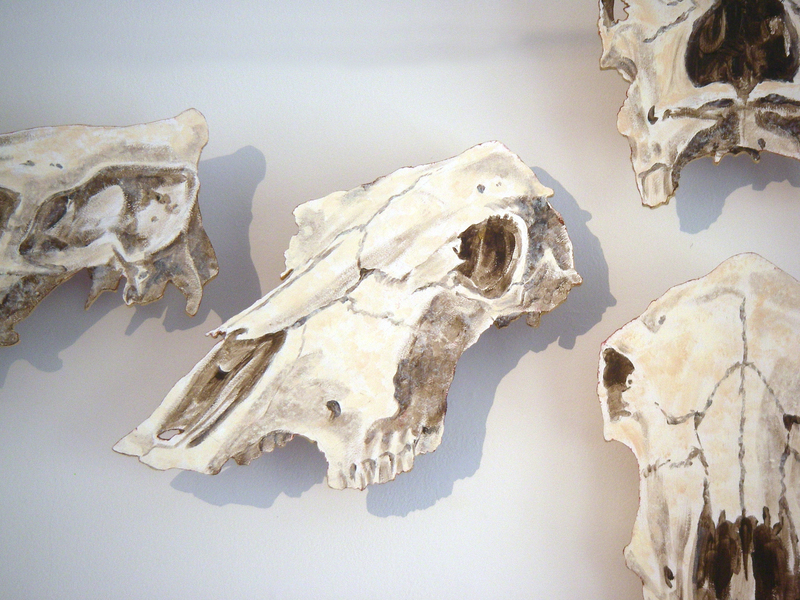 Each skull was sketched onto wood panel and painstakingly cut out with a variety of power and hand tools. The backs of the panels were painted with a glossy red enamel, giving the shadows a warm glow on the wall. This was first shown at the Maufé Gallery in Christiansted, St. Croix in 2007. This entry was posted in Christina and tagged 2007, farm life, inventory, large works, mixed media, paintings, sculpture, Senepol cattle, serial, solo exhibition, Wayfinding, wood panel. Bookmark the permalink.